Even if you aren’t a homeowner with trees on your property, you may still have legitimate concerns about trees with the potential to fall onto your property and cause damage of injury. Have you had the trees on your property properly assessed? Have you documented your efforts to ensure your trees are a reasonable risk and unlikely, in normal conditions, to cause harm to neighboring property? Can I make my neighbour cut down their tree? This is a common question, and usually the answer is no, not without a good reason. What is the basis of the request? Visual problems, blocked sight lines, excessive shade, a perceived loss of property value, and similar concerns are always secondary to the potential risk of harm or property damage. The best approach is always to talk with the neighbour as a first step. Often, an acceptable solution can be worked out. In some situations there may be a view covenant that defines the view and how it is to be managed. It is seldom possible to force tree removal simply because you don’t like the tree. What happens if my neighbour’s tree falls on my house? That will depend on several factors. In order to avoid liability, a property owner needs to be able to prove that the trees on their property had been properly assessed, and were a reasonable risk. If the property owner had been notified that a problem was believed to exist, and had taken no steps to investigate the situation, they may be liable for the resulting damage. If they can show that they had commissioned a competent risk assessment, and had taken all reasonable steps to deal with any identified problems, they may not be liable. Any damage that results from one or more of the trees falling down may be covered by insurance, but that too may depend upon whether not the owner took reasonable steps. In all cases, tree risk is assessed for normal operating conditions, so unusual weather events, such as major storms, landslides or avalanches create unpredictable conditions, and liability is less likely to be attached to the tree owner. The trees have already been identified as an unacceptable risk, but the owner failed to have a risk assessment undertaken to prove or disprove the initial claim. A risk assessment was undertaken, risk issues were identified, but the mitigation measures recommended were never implemented. Post failure investigations reveal obvious issues with the fallen tree(s) that ought to have been seen and dealt with by the property owner. Can I cut overhanging branches or roots from my neighbour’s tree? In practice, it is commonly held that you can cut back branches and roots that cross the property line without seeking permission of the tree owner, but there may be legal complications. In all cases you must know the exact location of the boundary and the tree. If the base of the tree straddles the boundary line, then the tree is jointly owned and both owners must agree on what can or cannot be done to the tree beforehand. If the base of the tree is clearly on one side only, then it is only owned solely by that property owner. If you do not own the tree, then pruning beyond the boundary will be a trespass, with all of the associated implications. Cutting overhanging branches may be a concern for tree health, but it does not present the same risk of liability that cutting the roots could create. If the roots or branches can be proved to be causing actual damage to your property, the justification for removing them will be strengthened. Have you confirmed your property line is correct? Do not rely on the location of the fence. Often these are not placed right on the property line. 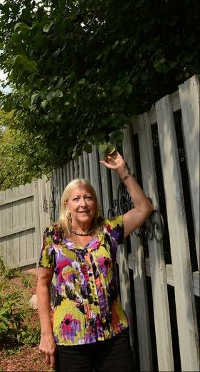 Have you asked your neighbor (in writing) to trim back the overhanging branches or unwanted roots? This is always a good first step since it’s not your tree. If you are unsure about the extent of tree roots, consider a more comprehensive investigation using an Air Spade. 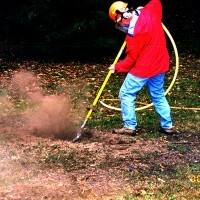 This allows for rapid removal of soil in order to expose roots or underground utilities for inspection and testing. Tree roots are not always easy to locate. In general, cutting roots is best restricted to situations where the roots are clearly causing damage. Try and avoid anything that could compromise the health and stability of a tree. When you contact the owner of the neighboring property, be sure to have the time, date, and people’s names written down, and ideally, have your request and their response in writing. Give the property owner sufficient opportunity to deal with the issue before taking further steps. Make sure any work done is well planned, clearly documented and undertaken by a qualified arborist, to avoid liability later on. Also be sure to clearly explain what is required to the person doing the work. If you are uncertain please call us. While each situation is unique, Dunster and Associates can review your case and provide expert advice. Julian Dunster wrote the book on trees and the law in Canada and is well versed in these matters. We also have a list of Municipal tree by-laws that can help homeowners understand local legislation. The safest way to avoid potential fines or costs associated with tree damage is to involve a qualified arborist from start to finish. Retain all documentation and keep it organized so that any legal concerns can quickly be addressed before they proceed. Use of the Air Spade allows for rapid removal of soil in order to expose roots or underground utilities for inspection and testing. Tree roots are a very complex topic to cover in a simple guide. In general you should avoid anything that could compromise the health of a tree regardless of who owns the property that the body of the tree lives on. Confirm that the roots are on your property and evaluate the necessity for removal. Contact the owner of the neighboring property in an official manner that you can prove. Give the property owner sufficient opportunity to deal with the issue before stepping in. Make sure any work done is documented and a qualified arborist has been consulted on the work to avoid liability. The safest way to avoid potential fines or fees for tree fall damage is to involve a qualified arborist from start to finish. Retain all documentation and keep it organized so that any legal concerns can quickly be addressed before they proceed. My neighbour cut one (or more) of my trees. Can I sue for damages? Are you certain that these are your trees? Were you properly notified of the concern(s) regarding the tree(s)/branches/roots? Did you respond (in writing) and, were you given a reasonable time frame to act on the notice? Have you clearly documented the damaged trees, and all associated factors such as names of people cutting the trees, name of the company, times, dates, other information? Did the offender obtain documentation that proves the work was done properly? Have any local bylaws been violated? Is the potential cost of a court action worth the effort relative to the value of the damaged tree(s)? In court, good documentation and expert testimony are essential to prove your case. A professional arborist will know how to properly document evidence and provide the right / relevant information that could be crucial in a legal proceeding. If you need more information consider obtaining a copy of Julian Dunster’s book “Documenting Evidence: Practical Guidance for Arborists” available on our web site www.dunster.ca or call us for a consultation. How do I place a value on trees illegally cut down on my property? Health of the tree at the time the damage occurred. Other tree and site characteristics. A skilled assessment is essential to fairly establish value. That requires more specialized knowledge and understanding of tree appraisal techniques. It’s not something that all arborists can undertake. It takes training and practice, and a pragmatic approach to derive a reasonable and unbiased appraisal. Julian Dunster has undertaken many tree appraisals and can work with you and / or your lawyer to provide an expert appraisal.